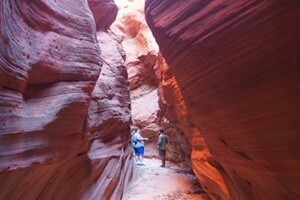 Orderville Canyon is an 8-hour hike through tight slots, into pools and over obstacles. While one of the more popular canyoneering routes, it has fewer visitors than the comparable Zion Narrows. 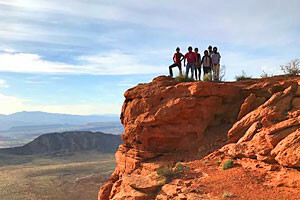 The route is a semi-technical hike, perfect for younger kids and beginners. There are no required rappels on the hike. According to many, Orderville is a less crowded and more scenic version of the Zion Narrows. Certainly narrower, the technical challenges keep enough people away to preserve the sense of isolation and excitement of exploring a new place. The hike into the canyon is short, getting hikers quickly into the canyon and following the watercourse through the canyon, at times less than 10 feet wide with walls hundreds of feet high. Swimming and wading is to be expected, as well as some semi-technical down climbs. There isn't a single rappel on the entire route, dropping the technical rating to 2B III. However, a 60-foot rope is required for dropping gear, setting up hand lines, and other safety measures. Jumping or sliding from rock to rock is a quick way to meet the search and rescue team. Best time to go: Summer and fall months are ideal because the warmer weather helps to alleviate the cold from the river. For access to Orderville Canyon, Zion requires a backcountry permit, so be sure to make a reservation online at http://zionpermits.nps.gov/ or call (435) 772-0170 for more information.